In the Texas House, they're seen as lobbyists. In the Senate, they sit at the press table. Two employees of the influential conservative group Empower Texans have been granted media credentials in the upper chamber. In the past — and in the House — they were rejected. It’s become a common scene in the Texas Legislature. A bill comes up for a vote — caps on property tax rates, maybe, or a referendum on “sanctuary cities” — and a text goes out. Lawmakers are told they will be graded on this one, and low marks, they know, could launch a primary challenge from the right. The sender, the scorekeeper and the eventual challenger is often Empower Texans, a Tea Party-aligned group formed in 2006 with millions in oil money that has worked to replace moderate Republicans with hardline conservatives. For the last decade-plus, the organization and its PAC — which blur the bright lines between newsroom, lobbying firm and political action committee — have aimed, with on-again-off-again success, to upend the Texas political scene with pricey primary challenges, by-the-minute scorecards of lawmakers’ votes and a lawsuit aimed at gutting a state agency. 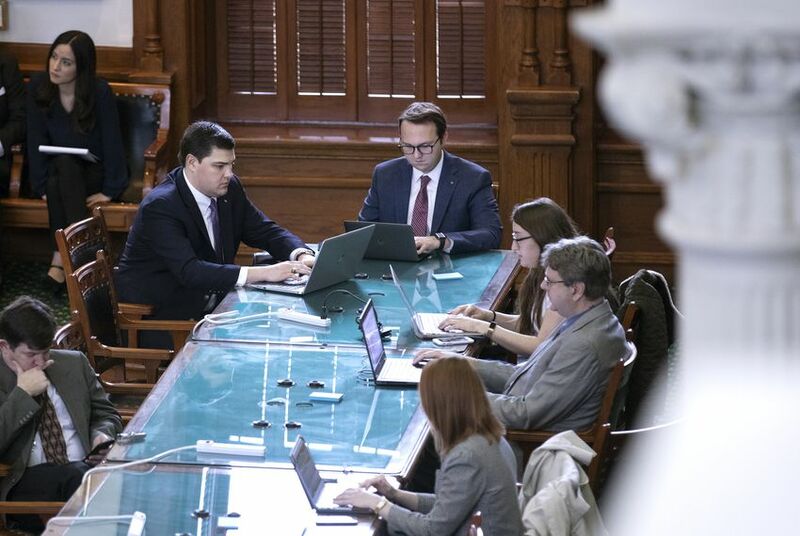 This year, instead of watching from the sidelines, two employees of Empower Texans’ reporting arm, Texas Scorecard, sit for the first time at the press table on the Senate floor, feet away from the lawmakers their organization has helped bring to power and the lawmakers their organization has failed to swat down. Curious observers are welcome in the halls of the Texas Legislature, but in the House and Senate chambers, they have long been relegated to the upper-floor galleries. Lobbyists, who are paid and who pay out large sums to boost or bust legislation, are barred from the floor. Aside from lawmakers, staff and special guests, only journalists are allowed on the floor of the chamber, where they have closer access to elected officials. The media credentials make way for a group that tries to thumb the scales — influencers, not observers, of the political game. And Empower Texans’ influence is notable: Last election cycle, the group’s PAC spent millions, a hefty chunk of that going to the upper chamber and to its Republican leader, Lt. Gov. Dan Patrick. Some lawmakers aren’t delighted about the prospect of looking into Empower Texans staffers’ eyes as they cast the votes that could be used against them in a primary challenge. So it’s little surprise that the decision to allow them access to the floor has set off political drama, creating rancor amid the calm, ceremonial opening weeks of session. “They’re an advocacy organization and a political organization. Far more than anything else, that’s really their identity. They have a PAC and they contribute to candidates,” said Sen. Kel Seliger, R-Amarillo, who has fended off Empower Texans-backed primary challengers more than once and clashed with the lieutenant governor in recent weeks. In news articles, Texas Scorecard describes Seliger as “the lowest-rated Republican senator,” based on its rankings. “This is an easy call,” he said. As rumors continue to swirl — Might the Senate axe the press table altogether? Could administrative staff be tasked with a repeat review of the 300-plus journalists already credentialed? — officials have stayed quiet. Sen. Bryan Hughes, R-Mineola, who now chairs the Senate Administration Committee, directed questions to the secretary of the Senate, whose office grants credentials. Secretary of the Senate Patsy Spaw hasn’t commented on the issue. The lieutenant governor’s office said only that everyone who applied for media credentials in the Senate received them. Several requests for comment from Empower Texans went unanswered. And the Texas Scorecard employees, Brandon Waltens and Destin Sensky (listed as Texas Scorecard’s capitol bureau chief and correspondent, respectively), have declined to comment except to reiterate that they hold valid credentials and that “there has been misreporting” on the issue. In the meantime, Waltens and Sensky are acting much the same as other members of the Capitol press corps: filing quick-turn stories about floor actions and slogging through long committee hearings. Texas Scorecard comes in paper and online; according to its website, it boasts six bureaus, and headlines range from the straightforward — “Bonnen Announces Committee Assignments for Texas House” — to the opinionated — “Democrats Push Job-Killing Wage Mandates.” The group’s Fiscal Responsibility Index, complete with text message alerts, designates lawmakers “pro-taxpayer” or “anti-taxpayer” for their stances on priority votes. Traditional media organizations, of course, report on how measures hurt or help everyday taxpayers; one even produces a list of “best” and “worst” legislators. Some newspapers’ editorial boards, separate from their political reporting staff, endorse candidates for election or advocate positions on laws. And some political reporters have worked for politicians or state agencies, as Waltens and Sensky have. But that’s a far cry from direct, immediate advocacy; newspaper reporters do not carry with them the implicit threat of a primary challenge. And perhaps most important, traditional media organizations are not affiliated with PACs — least of all, as Empower Texans is, one of the most influential, best-funded political action committees in the state. In the 2018 election cycle, candidates and other PACs reported receiving some $4.7 million from the Empower Texans PAC. Many of the recipients and the targets of that money now sit feet away from Waltens and Sensky on the Senate floor. Last session, after grading Seliger a C (career score: F), Empower Texans backed a primary challenger to the tune of $350,000. Seliger won handily. In the front row of the chamber, closest to the press table, sit both Sen. Pat Fallon, a Prosper Republican who — armed with an Empower Texans endorsement — ousted an incumbent Republican senator, and Sen. Beverly Powell, a Democrat who defeated Konni Burton, a conservative who won top marks on the group’s scorecard. The scorecards — and the ever-looming threat of money to boost a primary challenger — are present in lawmakers’ minds, current and former senators said. The move has turned many at the Capitol into amateur media philosophers: Does a lobbyist stop being a lobbyist once her organization launches a newsletter? Is a newsroom still a newsroom if it shares a name with a PAC? For press advocates — and for decision-makers in the Texas House — the answer is simple. “Based on this information, I believe that you are not eligible for a media credential,” Geren said, citing House rules. In previous sessions, Geren’s decision would have been it. Historically, the House has issued media credentials valid in both chambers. This session, the Texas Senate initiated a new policy, issuing its own media credentials. Both chambers’ rules bar anyone lobbying for or against legislation from floor access as a journalist. But the political atmospheres are different. Geren has been a top target of Empower Texans. Meanwhile, the group was an early — and significant — supporter of Patrick in his first run for lieutenant governor in 2014. The group’s PAC gave the Senate leader the biggest single donation he has ever received: $350,000 in May 2014, less than a month before he bested then-Lt. Gov. David Dewhurst in a Republican primary challenge. In the last five years, Patrick has received over $850,000 from the PAC. His office has repeatedly declined to answer questions on the credentialing matter. Asked about the flap in person by an Austin American-Statesman reporter, the lieutenant governor said only that “there’s been a lot of misreporting.” He declined to set the record straight. That’s led to speculation about why credentials rejected in the House won approval in the upper chamber. “Buying access?” questioned a column in the Austin American-Statesman. In private, lawmakers and their staff members have omitted the question mark. And in 2017, the Statesman reported, Geren revoked a press pass that had been issued for Cary Cheshire, now the treasurer of Empower Texans PAC and an employee of Empower Texans. Ryan Murphy and Cassi Pollock contributed reporting.